Now with a 10 year warranty! When an emergency occurs you need to act quickly to help save a life. The equipment you carry has to be light, durable, reliable, and have the power to save a life. The Heartsine Samaritan AED (or PAD - public access defibrillator) gives the first responder (EMS, Fire, Police and lay users) the tools to do just that. The Samaritan defibrillators are built on over 30 years of clinical research and bioengineering development by the pioneers of portable defibrillation. 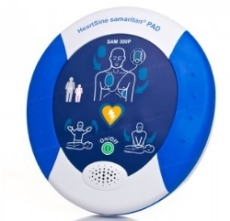 The Samaritan PAD is one of the lightest AEDs, weighing in at 2.4 pounds and has one of the highest IP ratings against dust and water damage. 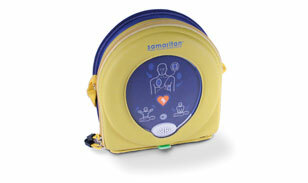 Package includes aed, 1 PAD-PAK (2 pairs of electro pads and a battery that is combined in one), 1 Yellow Soft Carry Case, 1 User Manual, 1 Quick Reference Instruction Card, 1 Training Toolkit CD, 1 Data Recovery Cable, 10 Year Warranty. Pad-Pak means the pads and battery are built into one unit. Why only one expiration date to monitor with the samaritan? This is an industry standard that is unique to only them. With other aeds, you have to check both the pads and battery expirations, which are always different. With the Samaritan, there is only one expiration date to be concerned about. The new innovative battery and electrode system cuts maintenance in half and helps ensure an optimal state of readiness. Just one expiration date and one product to track and replace!